ALL students, whether you rented your device from the district or if you already owned the device, must use the district-applied iPad settings and follow iPad expectations. (6th Grade Only) If you decide to use a previously-own device as your designated school device, it can only be used as a school device. 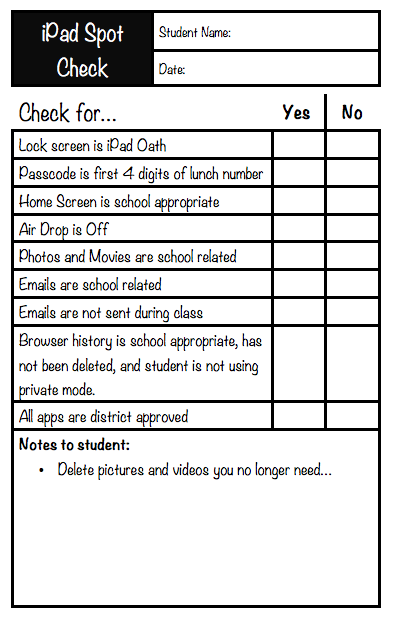 Random, periodic iPad checks are done throughout the school year. Students not following these expectations may receive consequences ranging from demerits to loss of technology privileges. Your Lock Screen should be the iPad Oath. ​Only your school email account is set up in the Mail app. Private browsing mode in Safari is NEVER enabled. Safari history and Email are not deleted by the student. I will take care of my iPad. Use school approved cases for maximum protection. Do not use iPads while walking through the hallway. Be careful when placing iPads in backpack. Do not use iPad around foods or drinks. I will practice responsible and positive digital citizenship with my device and my school accounts. Device is not used to harass, bully, or intimidate other students. School email accounts are only used for district approved apps and websites. Students should not create accounts with their school email accounts or subscribe to website services unless instructed by a teacher. I will use my iPad when instructed by my teacher. If a teacher has not specifically given you permission to be on you iPad, you should not be using it in any way. Emails should NOT be exchanged during class unless specifically instructed by a teacher. If you need to contact home, you may ask an adult to use a school phone. I will use my iPad as instructed by my teacher. If a teacher asks you to open Schoology, you should not be opening your Mail app or Safari. You should be on task. I WILL ONLY USE THE IPAD AND THE INTERNET FOR SCHOOL PURPOSES. ​ALL searches on Safari should be school-related. All pictures and videos taken on the iPad are for school projects. All email correspondence are school appropriate. I will adhere to district-applied settings, district approved apps and the user agreement.